Scarce minature map of London. Londres Ville Capitalle de l'Angleterre. 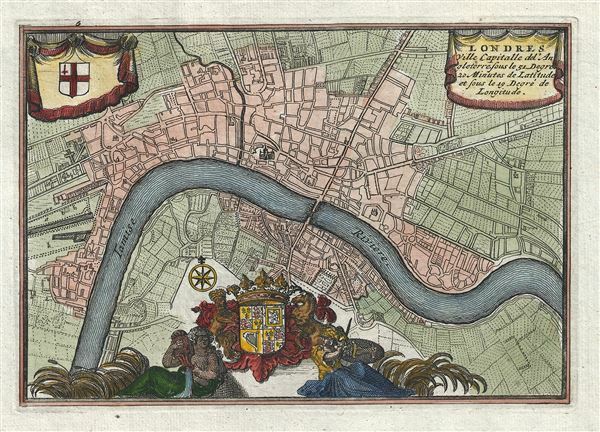 An extremely attractive and finely engraved 1706 Daniel de La Feuille miniature map of London, England. Centered on the Thames River, La Feuille's map covers London from Shoreditch to Shadwell and from Lambeth to St. James Park. Saint Paul's Cathedral and the Tower of London are clearly identifiable. The map features an elaborate royal crest flanked on either size by allegorical representations of the Thames and Britain (Britannia). A secondary crest, that of the city of London, appears in the upper left quadrant. The title is situated in the upper right. A Wesel , chez Jacques van Wesel, Atlas Portatif, ou le nouveau theatre de la guerre en Europe; contenants les cartes geographiques, avec les plans des villes and forteresses les plus exposees au revolutions presentes, (Amsterdam) 1706. Very good. Original platemark visible. Blank on verso. Clear dark impression. Howgego, J.,Printed maps of London circa 1553-1850, No. 52 -1.